Unless your home was built quite recently, it’s likely that the electrical system already needs some upgrading or repair. New electrical codes are making homes safer, and it’s important to keep up with the changes. And with technology accelerating at an ever-faster pace, the need for power grows every day. 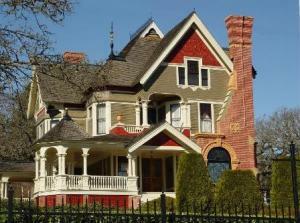 Older homes are especially hard-pressed to keep up with today’s electrical demands. The symptoms are obvious, but are often overlooked or ignored. “System Interruptus” puts you in the dark. If electrical circuit-breakers trip often, or fuses blow frequently, your circuits are drawing more current than they can safely provide. This may also indicate a dangerous fault on one or more circuits. The lights flicker and wane. Does your hair dryer give the vanity lamp a moment’s pause? When the fridge or air conditioner comes on, do the ceiling lights dim? Many motor-driven appliances draw lots of current and should be wired on dedicated circuits. If smaller appliances also cause problems, consider adding a 20-amp line to service them. There’s an octopus at many outlets. If plug-strips and multi-receptacle addons are strangling your outlets, your electrical system is working beyond capacity. Additional circuits with duplex receptacles are needed to restore order— and safety. Rug bumps mess up the carpet. If your living room looks like a snake farm with wires running under the rugs and furniture, a dangerous condition exists, and you definitely need more outlets. If some of those wires are extension cords, the outlets you have are too far apart. Both signs usually indicate that additional outlets are required throughout the house. Three into two won’t go. 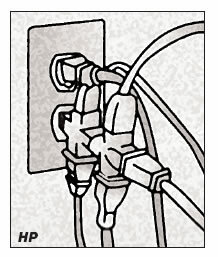 Many older homes have outlets that won’t accept three-prong grounded plugs. This is a bigger problem than not being able to plug in the microwave oven—it could indicate that your electrical wiring system is not fully grounded, and you’re not completely safe. The old standards just don’t apply. When you remove an outlet or switch cover, do you find bits of black rubber in the box? Are the wires covered in cloth instead of plastic? If you have an older home and the answers are yes, it means the insulation on the wires is antiquated and dangerously deficient for today’s electrical needs. You get a warm, tingly feeling all over. Are outlets, switches or other electrical- system surfaces warm to the touch? Do you see any blackening nearby on the switchplate or wall, switch terminals or wire ends? Does a switch or outlet give a mild shock? The problem could simply be too much demand on the circuit, or something far more complicated and dangerous. If your home was built or wired during the period from 1965 to 1975, it may even have aluminum wiring. If it does, have it checked regularly. It’s not safe to go near the water. Wet locations such as kitchens, baths and utility rooms, as well as grounded areas like your basement or garage, now require outlets protected by Ground Fault Circuit Interrupters, or GFCIs. Easy retrofit installation will make your home code-compliant—and safe. If GFCIs have already been installed near sinks and dishwashers, test their reset buttons to be sure they’re working properly. Rust is slowly taking over. If you begin to notice rust or moisture on or under your home’s main service panel, it’s a sign that something’s going wrong. Deterioration at the panel threatens the main wiring connections within, and could indicate similar problems throughout your electrical system. It’s not getting better—just older. If your home is more than 25 years old, and you’ve never upgraded your electrical service, you may be living with an inadequate and possibly hazardous wiring system. For your family’s safety and your own peace of mind, have an electrician inspect it and, if necessary, bring it up to today’s code standards. Circuit breakers trip or fuses keep blowing. Lights dim when appliances turn on. Too many plug-strips are needed at outlets. Extension cords are needed to reach outlets. Wall outlets don’t accept three-prong plugs. Wiring in outlet boxes is old and crumbling. Electrical fixtures feel warm or tingly to the touch. There are no GFCI outlets where required. Rust appears on the main service panel. Your service has never been upgraded. Thermostats come in two basic types, manual and programmable automatic. A programmable thermostat automatically sets back the temperature in your home based upon a predetermined schedule, While a non-programmable thermostat will stay at the same temperature 24 hours a day. The main advantage of a programmable thermostat is that you no longer need to adjust the setting before leaving the house or before bedtime. Programmable thermostats contribute to overall system performance, maximizing energy savings while providing complete comfort control. The precise temperature control of a programmable, energy-saving thermostat saves wear and tear on high-efficiency heating and cooling equipment by properly cycling the equipment. Offering set-it-and-forget-it programming, programmable thermostats make energy savings automatic. Precise control delivers the comfortable temperature you want while using the energy most efficiently. The big advantage to digital automatic thermostats is they will save you money and energy. Installing a programmable thermostat can save you up to 33% on heating and cooling costs. The thermostat will pay for itself, usually in the first season of use, and will continue to save you money year after year. Programmable thermostats are also good for the environment since they help save energy. One of the easiest ways to conserve energy is to use compact fluorescent light bulbs (CFLs). They use 66% less energy than incandescent bulbs. They cost more to purchase, but also last up to 10 times longer. Over the life of the light bulb, each 32-watt bulb can save $30 in energy costs. Thanks to new, stronger finishes, wood is good for almost any room. Rambunctious dogs and muddy sneakers won’t easily damage wood that has received a high-pressure factory finish. Engineered wood, made of bonded wood fibers topped with a real wood veneer, is even stronger. It expands and contracts less than solid wood and can be applied on a foam cushion over just about any sub-floor, including concrete. Or, consider laminate flooring, made by Pergo and other companies. It has synthetic backing and is coated with a faux wood veneer. Laminate is also hard to scratch. If your pup does manage to claw the floor, you’ll need to patch the damaged area or replace a panel; faux wood veneers cannot be sanded and refinished. Whatever you choose, put foot mats by doors, wipe up spills promptly, and watch out for kitty litter and other grit.